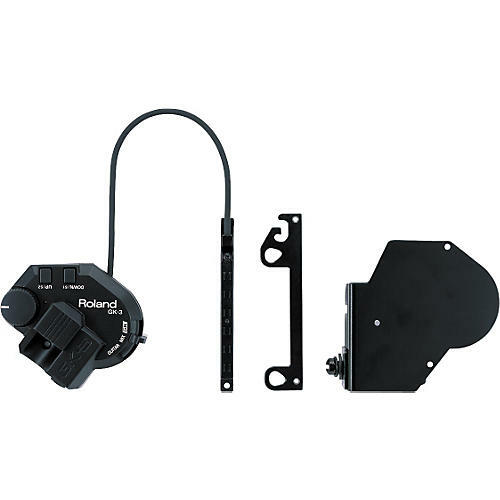 The Roland GK-3 Guitar Pickup sends individual signals from each guitar string to GK-compatible devices. It is carefully designed for guitar performance with a big, smooth GK knob for quick control moves. A selector switches between synth, normal guitar tone, and mixed settings. It comes complete with attachment accessories including double-sided tapes, a holder to secure the controller to your guitar's body, and a special pickup attachment plate for LP-style guitars. Other features include adjustable pickup cable length and a 1/4" phone jack for normal guitar use. The Roland GK-3 Pickup has been redesigned to adjust to the varying curvatures of different guitar models including pronounced archtops.